Battersea Borough Council met on 25 November. Amongst the reports presented to the council was a list of free uses of the Grand Hall in the Town Hall, two of the four were in aid of Belgian refugees – a dance and whist drive and a concert. Another concert was in aid of the Mayor’s Local Fund, so both causes continued to attract attention and funds from the local population. The meeting also saw the first official reports of Council staff killed in action. At this point 58 men were serving in some way, 30 of those in the Army and Navy and the rest in the Territorial Force or the National Reserve, leading to 18 temporary appointments having been made across the Council. The first death to occur had actually taken place on 18th September. Arthur Ernest Finchley was 26 and lived with his family on Cabul Road. He was one of 8 children and the 1911 census lists him as an Army Private, although he was working for the Council as a labourer in the works department in 1914. In 1911 one brother was a Navy stoker and another was an Army driver, while two of his sisters and another brother worked in a Card Box Factory – possibly the Corruganza in Garratt Lane. His father John was a night watchman for the Council. The other reported death was that of Able Seaman Arthur Charles Powell, who was a jointer’s mate at the Electricity Generating Station and was killed on HMS Aboukir. At the time his family were living in Vauxhall, according to the 1911 census he had a wife and two young daughters. The Council decided that a Roll of Honour should be prepared and exhibited in the Entrance Hall of the Municipal Buildings. This is currently in storage and will be restored to the former Town Hall, now Battersea Arts Centre, when their capital works project is completed in 2016. Battersea Borough Council met on 28th October. The question of managing Council staff serving in the Forces was raised, as the Committee of Management of the Employees Sick and Accident Society asked that their members should not be required to pay their weekly contributions whilst serving with the Forces. National Insurance was still a new idea in 1914 and there was no Welfare State, so being unable to work was a big risk for many people, the Society aimed to provide for employees who were off due to illness or accident. Seven of their members were serving by now, and the Council agreed to pay contributions for them. The Council also faced a request from the snappily titled National Amalgamated Society of Operative House and Ship Painters and Decorators (Battersea Branch) that they spread the work available over a double staff. Work was obviously starting to run short during the war, and Battersea decided that the best way to deal with this was to reduce the number of hours worked by their painters from 48 to 30 per week and then employ more men to cover all the hours. The decision to promote Roadman F Bench to Cleansing Inspector was also signed off, as the previous inspector, E Hawke, had re-joined the 23rd County of London Territorial Regiment. There had been an outbreak of scarlet fever in the borough, and Councillor Watts wished to know what the Council were doing to help. Health Committee Chair reported that the Asylums Board – who were responsible for Fever Hospitals as well as psychiatric care – lacked accommodation and that some of that was due to Belgian refugees, who were being accommodated in Asylum Board buildings. On the same page the South Western Star of 30 October reported other arrangements being made for Belgian refugees. The Welsh Calvinistic Methodist Church on Beauchamp Road had undertaken to support two refugee families as long as the war lasted, renting a property near Lavender Hill for six months to house the families. The paper reports that the Church was prepared to retain the house for longer if required. Other properties in the area had been given over to house refugees, a meeting in Clapham was also reported where it was announced that “Hollinghurst”, Clapham Common North Side and 9 Cedars Road had been given up for 30 wounded Belgian soldiers and 24 refugees respectively. Carlyle College, Clapham Common North Side was to be formally opened as a home for refugees on October 31st. Estimates of the number of Belgian refugees in Britain during the war vary between 225,000 and 265,000, and it is clear that a number of them found their way to Wandsworth and Battersea. Battersea Borough Council met on 14th October. One of the many items reported to the Council was that there had been 76 entries to the Battersea & Chrysanthemum Society in connection with the Garden Competitions on the Council’s housing estates, so life in many ways continued as normal around the borough. The war was having an influence on the matters considered by the Council though, the membership of the local relief committee was discussed, as was the need to employ temporary staff in place of those who had joined up. Other areas were affected as well – Messrs Ernst & Co were struggling to fulfil their contract to remove ashes from the Electricity Generating Station due to the war – exactly how the war had caused this is not specified. The meeting also agreed Morden Cemetery getting a new horse to replace one recently commandeered by the Army, so perhaps businesses were experiencing the same sort of problems. Slightly less obvious ways that the war was having an impact on Council business included the free uses of rooms in Council buildings. Rooms at Nine Elms and Latchmere Baths were used as workrooms for unemployed female works in connection with the Queen Mary’s Work for Women Fund, on request of the Mayoress. A room at the Central Library (Battersea Library on Lavender Hill) was given to the Battersea Battalion of the National Reserve for use as an office – the minutes do not specify which room but it must either have been in the basement or the office space on the second floor – now both used for storage. According to the South Western Star, most debate time was spent on the Highways Committee report, including the restricted lighting regulations brought in by the Home Office and the vexed question of whether or not Shirley Grove ought to be tarmacked. The paper also prints a letter from a sailor whose friend had been wounded when HMS Pathfinder was torpedoed and was home on leave. The sailor was out in Battersea wearing civilian clothes to avoid being “gaped at by everyone” when he was given a white feather by a young woman in the street, implying he was too much of a coward to sign up. The writer of the letter refers to this as “both silly and childish. No doubt it is well meant, but it often goes home to the wrong man”. The original recipient of the letter had contacted the Home Secretary to see if anything could be done about stopping the white feather campaign. The campaign was popular, but intensely disliked by some and both the campaign and the debate over it carried on. September 23rd saw meetings of both Battersea and Wandsworth Borough Councils. 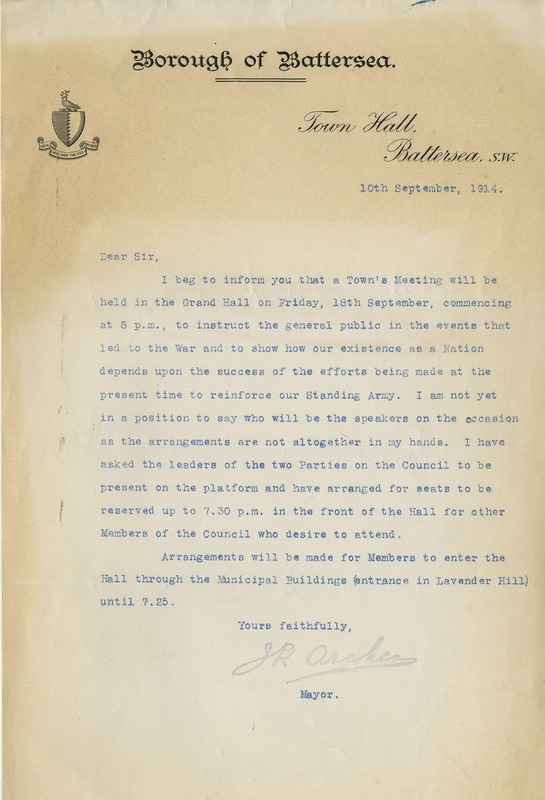 Local fundraising efforts for various Relief Funds were clearly well underway, Battersea granted use of the Grand Hall for a concert in aid of the Mayor’s fund and an entertainment for the Prince of Wales National Relief Fund as well as allowing the Lower Hall to be used for a concert for the Belgian Relief Fund, for swearing in Special Constables, as a space to mobilise the Boy Scouts and as a depot for the benefit of the war Distress Fund. Hiring the Grand Hall was £2 5s, the Lower Hall was 15s, although the Boy Scouts got it free. Free use of the Baths in the borough was granted to Territorials either resident in Battersea or whose HQ was in Battersea, and also to any Belgian refugee boys. Battersea also agreed to bear the expenses of the Committee set up to administer the Distress Fund in the borough, and turned to the more complex question of how to deal with staff who had joined the Forces. Information on service pay and allowances was proving difficult to get hold of, but the Town Clerk was assured it would be available soon. The Council decided to pay their staff full pay up until 24th September, then to pay the difference between service and Council pay. Staff joining up not only caused discussions over pay, but how to fill their vacancies – Deputy Town Clerk Edwin Austin was called up for service with the Territorials, and the appointment of a temporary replacement was agreed. [Edwin Austin later became Town Clerk and was known for his fondness for cycling]. The Medical Officer of Health was also off to join the Forces, having been offered a position with the Royal Army Medical Corps. There were also administrative issues raised by the War, a number of councillors expressed concern over the use of firms with German sounding names, and a resolution was passed that any payment made to those firms would have to be referred to the Finance Committee. The South Western Star reported that enquiries were to be made, and that disagreements arose over whether Ferranti Ltd was Italian or possibly German – they were actually a British firm. Meanwhile, about a mile and a half West, Wandsworth Borough Council were dealing with many of the same issues. They too decided to pay their staff the difference between Forces and Council pay, and guaranteed them a return to their old job when the War was over, with no loss of position or benefits. The Mayor and Town Clerk were given responsibility for taking decisions on how to handle the issue of vacancies. The Finance Committee agreed to fund offices and staff for the Borough War Relief committee, premises were provided in a building on the corner of Huguenot Place and Melody Road. The premises were meant to be leased for a year, with a secretary provided for six months. They also had to deal with the prospect of an increase in the local rate – the Board of Guardians had increased the amount required, which some councillors blamed on the Metropolitan Asylums Board and called for an increase in directly elected membership of the board to curb spending. Other councillors were concerned by the effect of the war on people if it went on for months, would an increase in the rate be too hard for them? The necessity of finding more money prevailed, however, and the rate was increased to 4s. Permission was granted for local rifle ranges to open until dusk on Sundays for the duration of the war, so that those who wished to join the Forces could practice drilling and shooting. This was also reported in the Wandsworth Borough News and the next column reported the results of the Novices’ Competition at Wandsworth Rifle Club – noting that membership was increasing every day due to the War, which explains the application for longer opening hours.